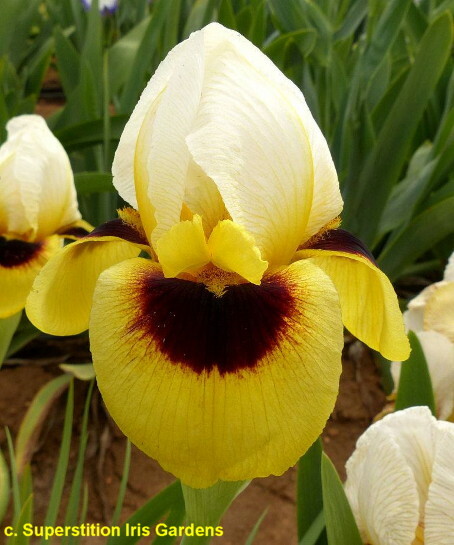 'Dragon's Eye' (Richard Tasco, R. 2015) Seedling 08-AB-04-06. AB (OGB), 26" (66 cm), Midseason late bloom. Standards cold white, mimosa yellow (RHS 8B) at base, few bright canary yellow veins on midrib; style arms bright canary yellow (9B), darker on rib top; Falls mimosa yellow, darker surrounding signal, large oval shaped dark burgundy signal, darker veins lighter around beard, some dots and streaks at edge of signal; beards golden yellow in throat, bronze yellow ends; slight fragrance. Seedling 05-AB-03-05: (01-AB-13-01: ('Sheik' x 'Bagdad's Folly') x 'Noble Warrior') X 06-AB-05-50: ('Noble Warrior' x 02-AB-26-03: ('Energizer' x Bagdad's Folly)). 2015 Superstition. Honorable Mention 2017.